The 75th anniversary of the internment of people with Japanese ancestry during World War II is spurring members of a Seattle church to share their stories — and support local immigrants and refugees amid the furor surrounding President Donald Trump’s immigration policies. 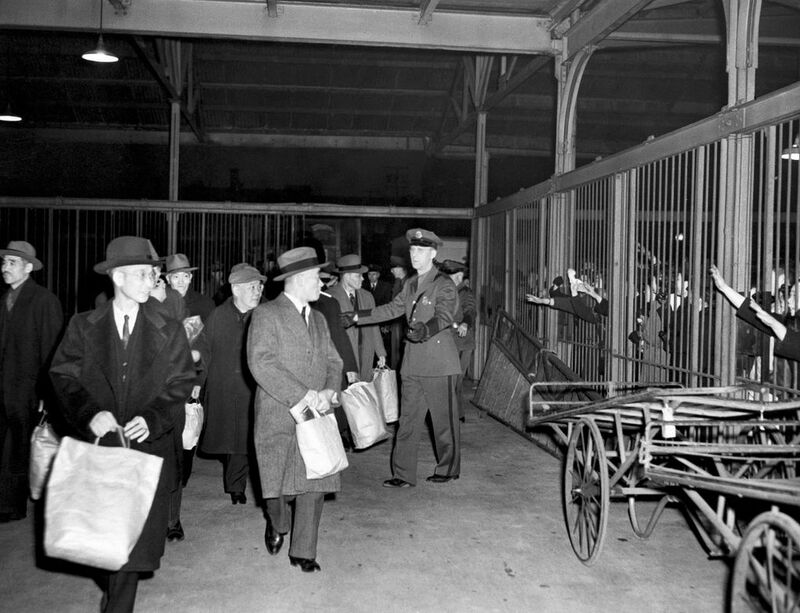 It wasn’t until they were locked behind barbed-wire fences, and assigned to either barracks or horse stalls for living quarters at the state fairgrounds in Puyallup, that it all suddenly became real. 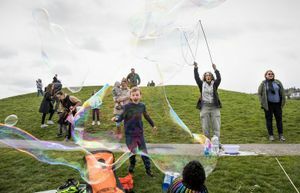 Until that moment it did not seem possible that the United States would turn against its own citizens, said Louise Kashino-Takisaki, 90, of Seattle. “We thought that maybe our parents, who were immigrants, could be affected, and that maybe we would be separated from them. But we did not think they would put us in camps. We were citizens who were born here,” she said. 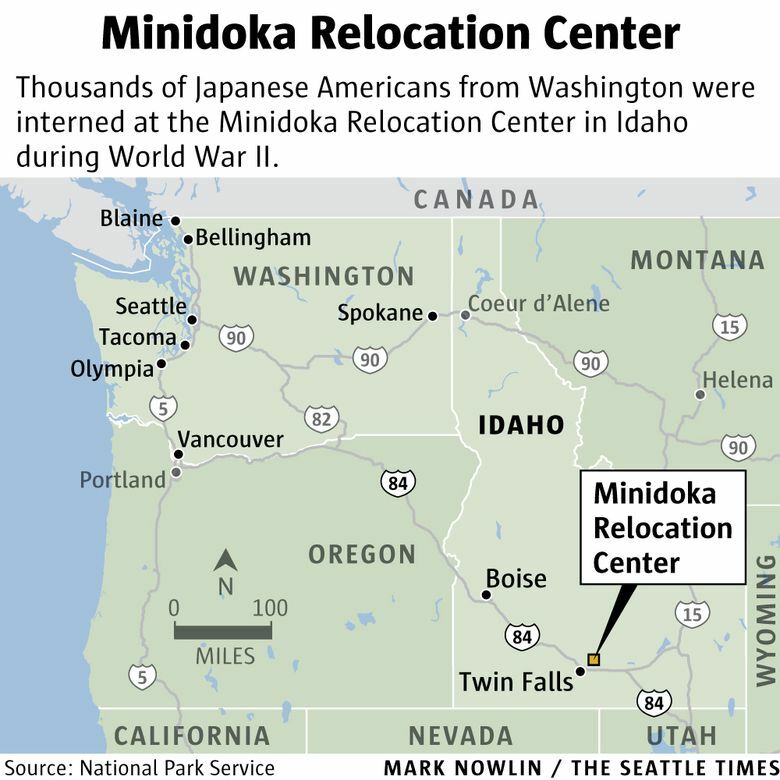 Kashino-Takisaki was 17 when she and her family were sent to the Minidoka War Relocation Center in Idaho after a short stay at the temporary assembly center in Puyallup. 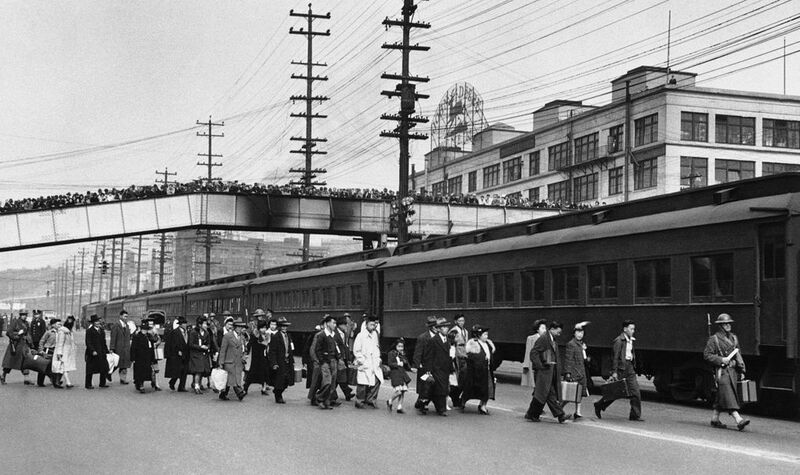 She and several other members of Blaine Memorial United Methodist Church gathered at an apartment in Seattle’s Chinatown International District recently to talk about what happened to them during World War II. Seventy-five years ago — on Feb. 19, 1942, three months after imperial Japan bombed Pearl Harbor — President Franklin D. Roosevelt signed Executive Order 9066. 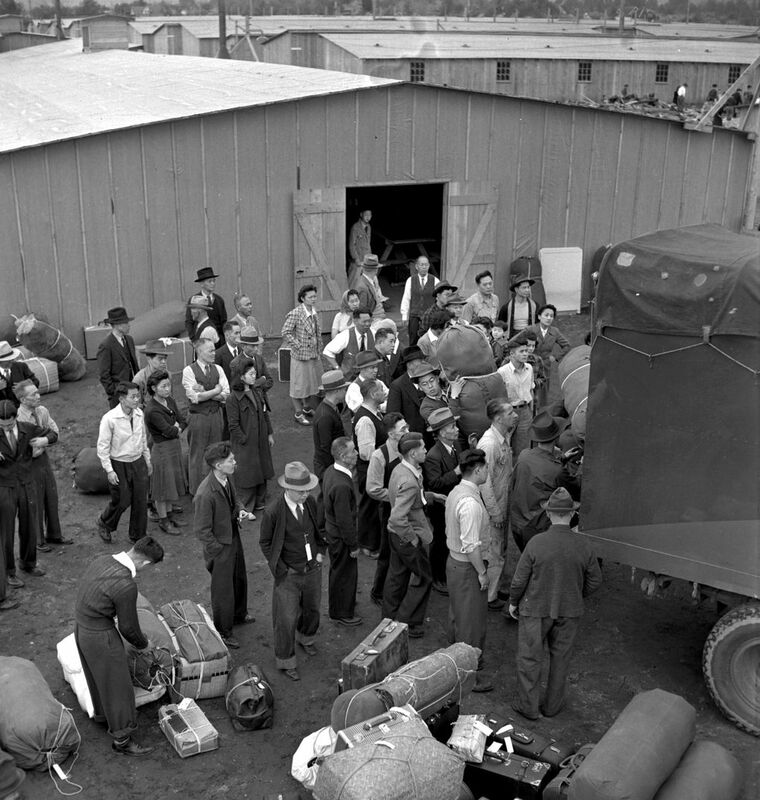 The order allowed the secretary of war to declare that an area was a military zone, clearing the way for more than 110,000 immigrants from Japan and Japanese American citizens who were living in Washington, Oregon and California to be evacuated and interned. 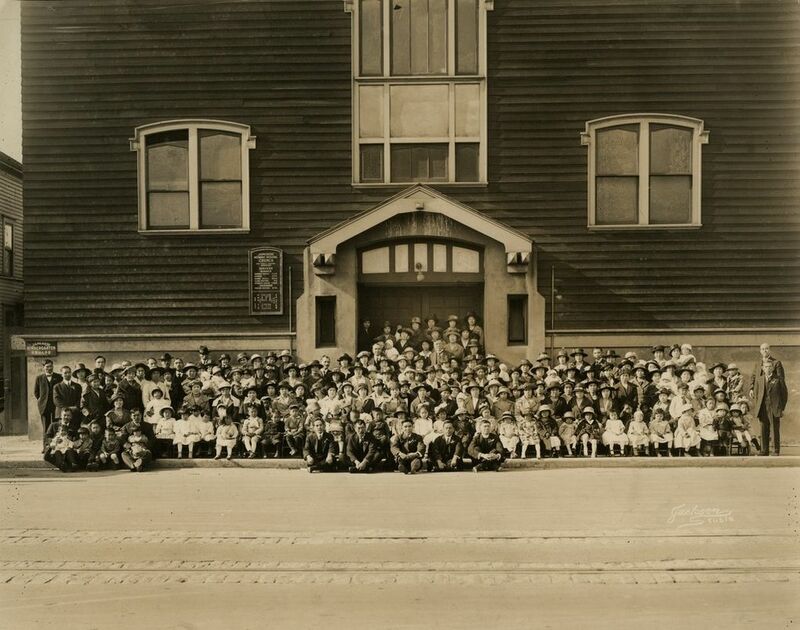 The entire membership of the church, then called the Seattle Japanese Methodist Episcopal Church, was interned. The 75th anniversary of the internment, says its senior pastor, the Rev. Derek Nakano, resonates with particular poignancy as President Donald Trump attempts to draft new immigration policies. Nakano has asked his parishioners to tell their own internment stories and support immigrants and refugees. “Because of their unique history as Americans who were incarcerated as ‘enemy aliens,’ they have a special responsibility to tell their stories, educate others and take a stand,” Nakano said. Trump on Jan. 27 signed an executive order that sought to “protect the nation from foreign terrorist entry into the United States” by imposing a 90-day travel ban on the citizens of seven countries: Iraq, Syria, Iran, Sudan, Libya, Somalia and Yemen. In addition, the order called for a review of current visa and refugee programs. A federal court judge in Seattle issued a stay on Trump’s travel ban, which had prompted protests across the nation. That stay was upheld by the 9th Circuit Court of Appeals. The Trump administration announced Thursday that it would write a new order rather than appeal the 9th Circuit decision. 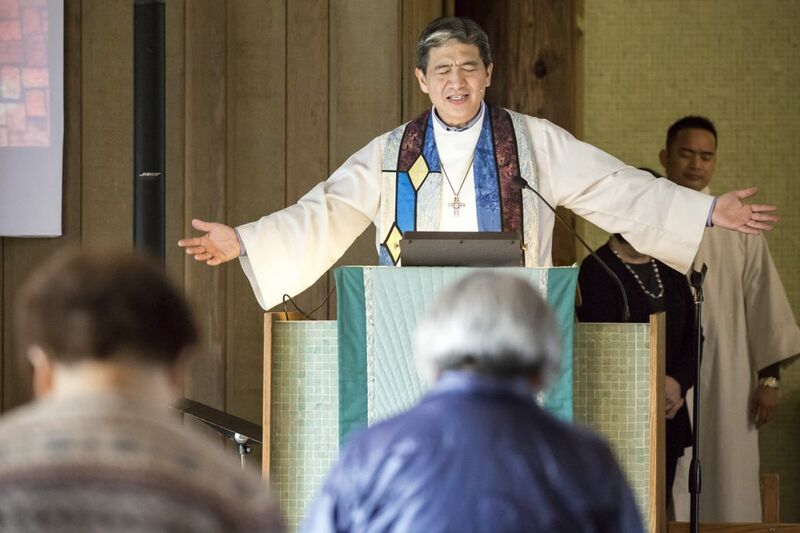 In sermons leading up to the anniversary, Nakano recounted the history of the internment and the story of the 113-year-old church. The church was spared during the war when the Rev. E.L. Blaine, a member of one of Seattle’s founding families, held the deed in trust until the church’s congregants were released from the camps in 1945. Yes, his congregants have said. The Beacon Hill church will donate all of the profits from its annual fundraiser to two local Muslim organizations: one on the Eastside that was a recent victim of vandalism and arson and another that works with Somali refugees. Some of the younger church members are working directly with foreign college students here on education visas and nervous about what the future holds. 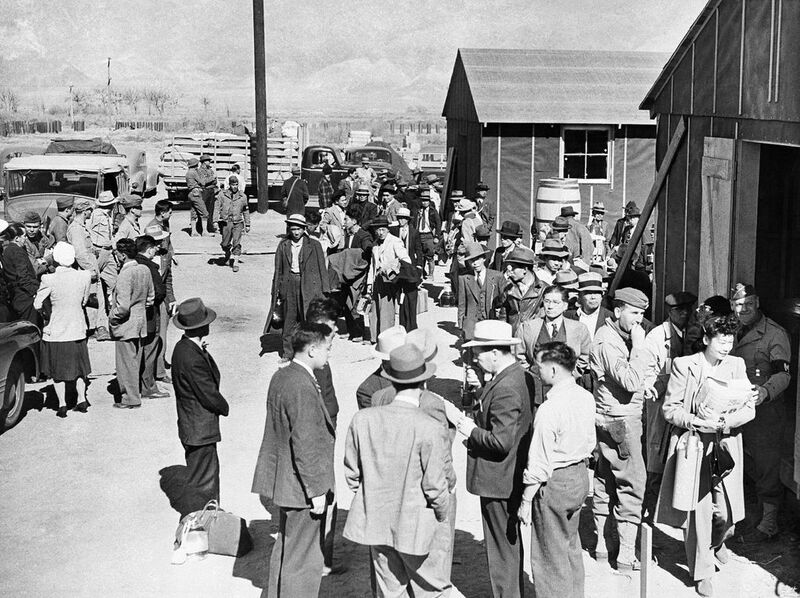 In addition to connecting them to critical legal resources, “We are trying to be visible allies,” said Bif Brigman, a planning-committee member for the annual pilgrimage to Minidoka, Idaho, the camp where the majority of Washington’s internees were sent. “It’s important for them to know that we are actually here, that we understand, that we support them and that they do not have to defend themselves on their own,” Brigman said. 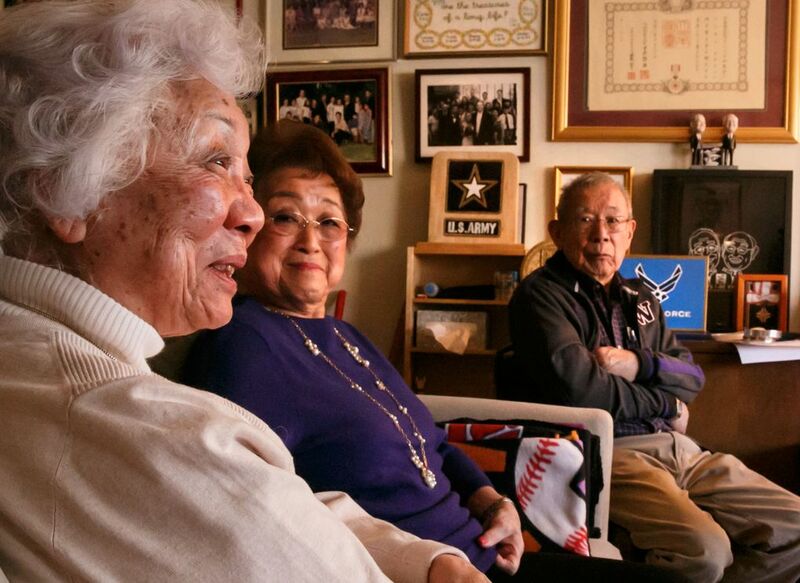 Like many Japanese Americans who were evacuated from the West Coast and forced into internment camps, none of the church members gathered at that International District apartment — Kashino-Takisaki, Marianne Tada, 82, and Tosh and Toshi Okamoto, 90 and 93 — had spoken much in the past about those years. In some cases, even their own children had not heard their stories. “It is part of our culture to endure and to accept something that cannot be helped,” said Tosh Okamoto, who fought in the U.S. Army’s famed 442nd Regimental Combat Team after he was interned. “They didn’t want to make us bitter,” added Nakano, whose parents were also interned. But, Nakano said, with recent developments in the country’s immigration policies aimed at Muslims, refugees and undocumented immigrants, it seemed time to tell those stories. Kashino-Takisaki, whose parents owned a grocery store, and Toshi Okamoto, whose parents ran a hotel, were seniors at Broadway High School in Seattle when the executive order was signed. Tosh Okamoto was working on his family’s farm between Renton and Kent. “We were poor farmers,” he said. Kashino-Takisaki remembers the “shame, humiliation and embarrassment” her parents felt on Dec. 7, 1941. Her father put a large sign that said, “We are Americans!” in the window of the family’s store. But still customers stayed away until they needed the credit he extended in those days. People destroyed or burned pictures of the emperor of Japan and other signs of their heritage. Children were told to speak only English. When they were forced to evacuate, they sold the store for pennies on the dollar, said Kashino-Takisaki. “We were exploited,” she said, about the thousands of West Coast Japanese-American families who lost their homes, churches, businesses, personal possessions and years of hard work. At the end of March 1942, nearly 300 Japanese Americans living on Bainbridge Island became the first people in the country to begin the forced journey to internment camps. Over the next few months, nearly 13,000 Washingtonians would join them. Each person could take only one small suitcase, said Toshi Okamoto. 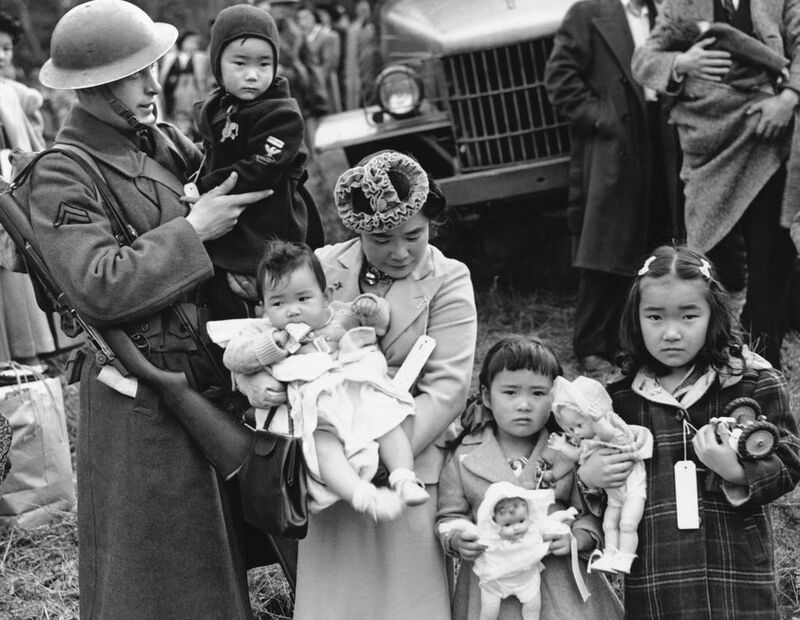 But it wasn’t until they arrived in Puyallup with thousands of other Japanese Americans, filling mattress sacks with hay, each family assigned to a horse stall or a barracks, that Kashino-Takisaki accepted what was happening. In 1988, President Ronald Reagan signed legislation that offered a formal apology for the internment and $20,000 in compensation to each surviving internee. Despite what Nakano described as “deep psychic scars” caused by the internment, there were also some unexpected blessings, he said. Tosh Okamoto said that because of the internment, Japanese Americans grew to know each other well and form a very tight-knit community. Lifelong bonds of friendship and marriage abounded. Kashino-Takisaki met her first husband, famed war hero Shiro Kashino of the 442nd, while inside Minidoka. He died 20 years ago and she has since remarried, she said. And Tosh Okamoto, who as a mechanic became the first Japanese American to work in the Seattle Fire Department, was inspired to co-found Nikkei Concerns. The charitable organization that cares for the elderly was formed after he and others saw what happened to the parents of sons who had died proving their allegiance to the U.S. in the war. All four parishioners said they’ll open their homes to refugees if needed and that they’ll defend this country, its principles and its people as long as they’re able.